Ready for your next armored spearhead. Close reproductions of the WWII originals worn by legendary U.S. tankers. Each represents the backbone of the land driving force whose mission was to provide infantry support and take out countless enemy positions. Plus risky tank against tank duels. U.S. Military WWII Tanker Jacket, Reproduction is rated 4.2 out of 5 by 5. Rated 5 out of 5 by Bobby from Fine product. 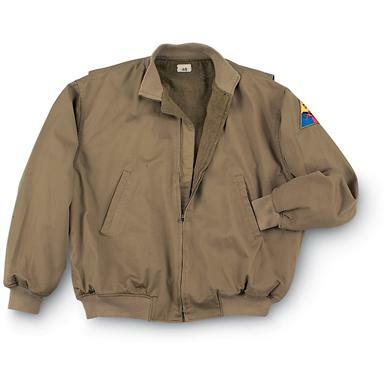 this Tanker Jacket is a high quality, accurate reproduction. Rated 4 out of 5 by TomC from Very Authentic Reproduction This is an excellent reproduction of the WWII Tanker Jacket -- which is also the only thing wrong about it as a jacket. Like the original, it is lined in very heavy, very itchy wool (at least as heavy and scratchy as a brand new wool Army blanket that hasn't been washed a few hundred times yet). It's fine over a heavy long-sleeve shirt, but you can't wear this jacket over bare arms or over something like a thin long sleeve T.The jacket is very warm, but unlike modern jackets of similar warmth it weighs a ton. I highly recommend this jacket IF you want an authentic WWII style tanker jacket, but not if you are a later-era tanker looking for the jacket that you remember wearing.The jacket comes with an authentic reproduction 6th Armored Division shoulder patch (not the 2nd Armored Division patch that some Fury fans might be hoping for).The jacket runs pretty true to size, just a little big which is very different from most similar jackets that almost always run way small. Order your regular size. If you're one of those between-size people, you probably should NOT go to the larger size. Rated 4 out of 5 by Nivekeel from Fathers Day Gift I got this jacket for my Dad as a Fathers Day gift. After proudly announcing that it was an authentic reproduction and made in the USA. Upon opening it the first thing we saw was the big Made In CHINA sticker. Quite the let down, however it is a high quality made Jacket so still pleased. Rated 5 out of 5 by aef111 from Nice jacket I bought this a few years ago when I became a volunteer for the WWII museum. It is one of the warmest jackets I have of any kind. I wear it everywhere. A unique find, rescued out of storage. 6" x 3" x 9"